Dr. Leiv M. Takle Jr. was born and raised in Georgia and grew up on his family’s farm (LeiKri Farms) in Concord, GA. He currently lives in Griffin, GA with his wife Lindsey and four children, Macie, Bella, Liam and Finley. Dr. Takle Jr. specializes in comprehensive eye care, no injection, no stitch cataract surgery, glaucoma surgery, treatment of macular degeneration, dry eyes and diabetic retinal disease. Dr. Takle Jr. is fellowship trained in oculoplastic, orbital, and cosmetic surgery and specializes in blepharoplasty, eyelid and facial skin cancer reconstruction after Mohs Micrographic Surgery as well as nasolacrimal duct surgery. He is a member of the American Academy of Ophthalmology and the American Society of Cataract and Refractive Surgery. 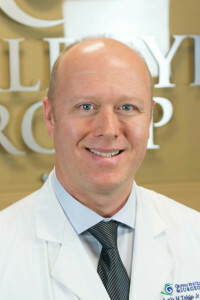 He was recently appointed to the council of the Georgia Society of Ophthalmology and is an active member of the Medical Association of Georgia. Dr. Takle Jr. is a diplomat of the American Board of Ophthalmology and is a board-certified ophthalmologist. Dr. Takle Jr. did his internship and ophthalmology residency training at the well known Emory Eye Center. He is trained in the latest technology including no injection, no stitch, cataract surgery and the latest in oculoplastic techniques including reconstruction of eyelids after skin cancer removal, blepharoplasty, ptosis repair, brow lifts, and Botox and fillers. At the Takle Eye Group, we have all that one could wish for in a total, comprehensive eye facility: 35 years of proven, elite care.